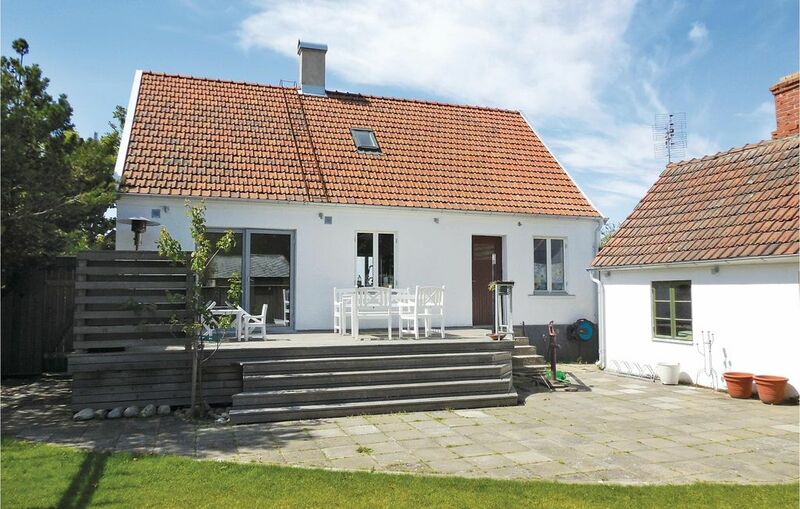 This renovated and stylishly furnished holiday home is in the centre of Österlen, on the outskirts of Tommarp. There are three bright seating areas from where you can enjoy the different views and relax in the peaceful countryside. The fenced garden has a wooden terrace. This terrace is ideal for spending relaxed hours with friends. This home also has a football ground. There is a bedroom with a toilet on the top floor, and a living room with sofa bed. There is another living room and an ‘eat-in kitchen’ on the ground floor. A bathroom and a hot tub for two people are available. A staircase leads to the top floor. It is safe for children, with a child lock being provided at both levels - upstairs and downstairs. Enjoy your holiday in Österlen, with various tourist destinations, farm shops, galleries, good cafes, restaurants and wonderful natural sandy beaches in the neighbourhood. Visit the Stenshuvud National Park, Glimmingehus Castle, Ales Stenar near Kåseberga Fishing Village and Christinehof Palace with its Eco Park. Enjoy a leisurely stroll in Simrishamn, 10 minutes away by car. A visit to the galleries and farm stores in the region is recommended. Golfers can choose from two courses in this region. Österlen is famous for its beautiful natural landscape and sand beaches several kilometres long. Do also visit the fishing villages namely Kivik, Brantevik and Skillinge. You can rent a bicycle and explore Österlen.